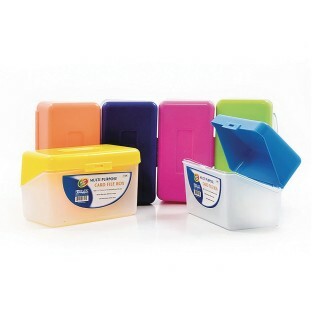 Suitable for organizing your index cards. Comes in 6 different bright colors. Suitable for organizing your index cards. Holds 3” x 5” (7.6 cm x 12.7 cm) cards and fit up to 250 cards. Ideal for filing notes, addresses, and recipes. Latch closure keeps contents secure. No color choice.